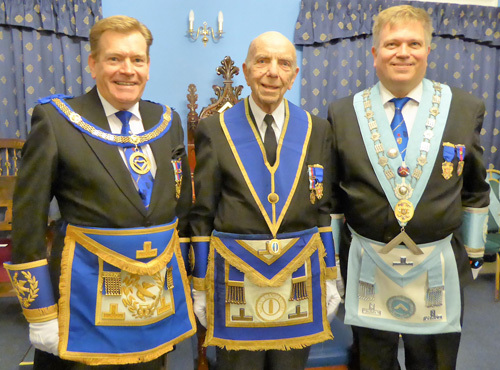 There is nothing a lodge likes more than a celebration and on this occasion there was a golden celebration at Woolton Lodge of Unity No 1086, held at Woolton Golf club. Pictured from left to right, are: Kevin Poynton, Jack Thomas and Christopher Taplin. The usual opening business of the lodge was despatched with alacrity so the celebration could commence. 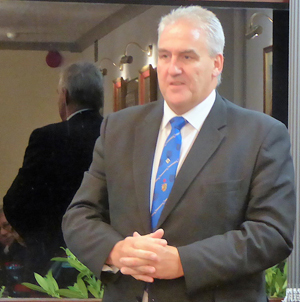 The Provincial Deputy Grand Director of Ceremonies Ian Halsall, announced that Assistant Provincial Grand Master Kevin Poynton was outside the door of the lodge and demanded admission. Kevin accompanied by fellow Assistant Provincial Grand Master David Ogden, grand officers and acting Provincial grand officers, duly entered the lodge and were warmly welcomed by the WM Christopher Taplin, who offered Kevin the gavel of the lodge. It was no surprise that Kevin duly accepted the gavel, allowing the celebration to begin. Salutations were offered to Kevin and David, who were pleased to receive them. Kevin thanked the WM for allowing him to lead the celebrations and asked that the tyler be allowed to sit inside the lodge room. John Hibbert duly entered. Kevin opened his remarks by saying that in the late 50s and 60s Freemasonry was very strong and some say the reason for this was because men still wanted that camaraderie that was generated by the war years and in the early years after the war, but Kevin holds the view, that in addition, the vast majority wanted to put something back into the community in general. Those early Masons were the forbearers of the same values that we still hold dear today, integrity, honesty, kindness and fairness, not just to fellow Freemasons but to everyone they came into contact with. Kevin then asked the PrDGDC to place John David Thomas, known to all as Jack, on the floor of the lodge and to ensure he was seated comfortably, that he may present to the brethren assembled a brief history of one of those cherished brothers who has now become a member of the illustrious 50s club. Kevin then embarked on a very fascinating and enlightening reflection on Jack’s domestic, professional and Masonic life. On 19 February 1935, at Dawber Street, Everton, Owen Thomas and Mary Thomas presented the world with their son Jack. He was the second son born to the family and there was to be a third just over 12 months later. Owen served in the Great War from 1914-1918 and was a stone mason of the operative kind, working on the Liverpool Anglican Cathedral for most of his life. Jack’s older brother Owen, joined the Royal Air Force, but was posted as missing in action on his second mission over Yugoslavia. Jack’s younger brother Peter still lives quite close to him in Sandiway Avenue, Widnes. Jack started school around the age of five years old at Finch Hall County Primary School, Colwell Road, Liverpool 14, known locally as Colwell Road School. Known by the kids as ‘Colly’, it was here that Jack spent his infant and junior school days. Following junior school, Jack moved to Finch Hall Secondary Modern and did quite well. He was appointed house captain, then school vice-captain and became house rugby captain, school rugby captain and also Liverpool Schools rugby captain. Jack’s father unfortunately passed away when he was about 12, but his mother recounted that on several occasions before he died, Owen spoke about the importance of Jack obtaining an apprenticeship in the future. Jack Thomas(right), receives his certificate from Kevin Poynton. Getting fed up with being captain of everything at the ripe old age of 15, Jack decided to leave school, but was undecided what to do. He had always had a hankering for being a car mechanic, but his pal Norman, whose dad was a printer, said he should have a go at printing. Jack mentioned this to his mother who encouraged him to take the printing industry entrance exam, which he took and passed. Jack eventually got work as an apprentice compositor at Liverpool Printing and Stationery Company in South Castle Street, Liverpool. Jack stayed with the company until he came out of his time. During this period Jack met his future wife Winifred at Alan Joliffe School of Dance on Prescot Road, where they became dance partners. When they were paired up Jack was already part of a formation team that were about to dance in a film with Arthur Askey, however he was called up for National Service in the RAF and so neither of them were able to take part. Jack’s time in the RAF wasn’t quite how he thought it would be, as before being called up he was seeing the orthopaedic surgeons in Broad Green Hospital, and 10 months into National Service he was called back to the hospital for surgery, after which they requested assurances from the RAF that their medics were able to continue the after-care, which they couldn’t, so it was ‘goodbye’ to his National Service. In 1957 Jack moved to a new job with Eric Benrose in Long Lane. This was a printing company that produced comics such as the Eagle, Swift, Girl, Robin and most of the other comics, as well as magazines such as Women’s Weekly and Women’s Own. Shortly afterwards in March 1958, Jack and Winifred were married at St Anne’s Church in Old Swan Liverpool. About 12 months later their daughter Jane was born and two years after that Geoffrey. Jack is the proud grandfather and great grandfather of six grandchildren and four great grandchildren respectively. Jack stayed at Benrose until 1981 and it was at this time that Robert Maxwell and Rupert Murdoch appeared on the scene. They were ruthless businessmen and got all the employees together to tell them their intentions. Jack immediately saw the writing on the wall and true to fashion, was soon made redundant. An advert in the Liverpool Echo caught his attention posted by Merseyside Police looking for a Warrant Officer, Jack applied and was successful, being promoted to Senior Warrant Officer in 1989. In 1997 Jack retired from the work as his wife’s health was beginning to fail and over the next six or seven years he never missed a single day with her. Sadly, Winifred passed away in May 2004. Group chairman Andrew Whittle proposes the toast to Kevin Poynton. Turning to Jack’s Masonic career, Kevin informed his audience that Jack was proposed into Masonry by Norman Davies and seconded by George Castles, with whom he was unfortunately never to get the opportunity to sit in lodge with. Nevertheless, on Wednesday 15 May 1968 at Hope Street Masonic Hall, he was initiated into Walton Lodge. Hope Street went on fire the following October so the lodge had to move to Balliol Road, Bootle, where he was passed to the degree of a fellow craft. For some reason the lodge moved to Reece’s, where he was raised to the third degree. The lodge later moved to the Racquets Club and in February 1981 Jack was installed as the WM and went onto become the director of ceremonies from 1984 to 1996. In May 1987 Jack was appointed to the acting rank of Provincial Grand Steward. Jack was also team leader when the group had the responsibility of hosting Provincial Grand Lodge at Blackburn, as well as serving as a group steward at masters and first principals’ dinners. In 1991 Jack was promoted to Past Provincial Senior Grand Deacon and then in 1998 to the extremely high and much sought-after rank which he currently holds, of Past Provincial Junior Grand Warden. 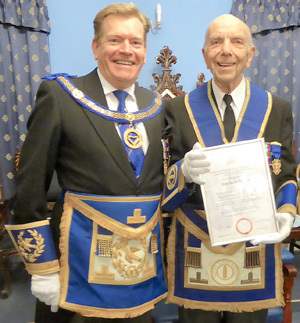 In the Royal Arch, Jack was exalted into Walton Chapter No 1086 on 14 May and then installed into the fist principals chair in 1987 and appointed to the rank of Past Provincial Assistant Grand Sojourner in 1994. Before completing his speech, Kevin remarked that the members of this lodge, like many others, have had to work hard to keep things going and when lodges find themselves in a position where they have to consider amalgamation, just like this lodge did, it is without doubt a major decision. Back in 2005, no less than four lodges got together and decided to become this one amalgamated lodge, with a further increase in membership from a lodge that handed back its warrant. To those members Keven offered his appreciation for keeping it going, for driving it along and keeping the history of all those other lodges alive. It’s a huge task, which still needs the support of every one to keep it going, so please don’t stop. As the celebration of a brothers 50th anniversary in Freemasonry is always marked by a commemorative certificate from the Provincial Grand Master Tony Harrison, Kevin called upon the group chairman Andrew Whittle to read the certificate before presenting the same to Jack. Once other lodge business had been transacted, the lodge was duly closed so that everyone could retire to the dining room to continue the festivities. Andrew Whittle proposed the toast to Kevin and in his response, Kevin thanked the acting officers for attending, together with the PrDGDC, remarking that the Province was very fortunate to have such a hard-working bunch of publicity officers and last year no less that 1068 articles had been produced. Kevin went on to thank the Woolton Group Publicity Officer Colin Roberts for all his hard work. A raffle was held and the proceeds of £110 went to lodge funds. Norman Davies a lifelong friend of Jack proposed the toast to his health, remembering the happy days gone by, saying that he would not tell us Jack’s age, but Norman was two months older and he was 83! In response, Jack thanked everyone for attending to celebrate his jubilee. The WM presented him with a bottle of liquid refreshment and the group chairman a card from the executive. It had been a great evening and one that Jack will always remember. Story and pictures by Colin Roberts. Assistant Provincial Grand Masters, grand officers and acting Provincial grand officers.